Twin sisters who were very different in their personalities yet identical in their love and devotion to our family. Daisy was our indoor, comfort girl. She loved to be cuddled up on a soft rug within earshot of the kitchen in case any treats were being given out. Maggie was our outdoor girl. She loved lying in the yard watching the birds and feeling the sun on her fur. 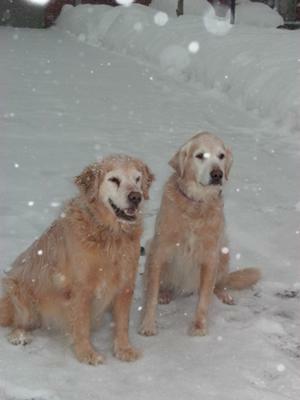 We lost Maggie in 2010 at 13 and Daisy just last month at 14. They both were full of life and love and there isn't a day that goes by where we don't say how lucky we were to have two wonderful goldens! We have just lost the love of our lives. a wonderful male Golden called Barney. He was (is) an angel on this earth. Everybody who met him just fell in love with him. We're totally heartbroken. Love you so much Barn, till we meet again darling! We miss you, Daisy and Maggie!! You were both so sweet and loving. Glad you get to play together forever!